The Food Safety and Standards Authority of India (FSSAI ) has given opportunity for Food Business Operators (FBOs) can apply for Fssai license through online Registration/Licensing System. It also provides an option to track the status of application online through an Application Reference No. provided by the system at the time of submission of application. It also provides option for FBOs can Renewal their Fssai License online. 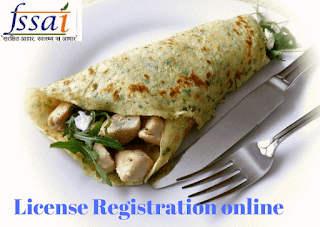 How to apply Fssai License through online Registration system ? Once eligibility Process is completed, You need to Userid & Password for login to system. If the FBO is operating in more than One(1) state then the option Yes to be selected otherwise No. Select all the kind of Businesses which are located in a single premise for which License is to be applied. For each Kind of Business selected, check the capacity/turnover for determining the eligibility for that category. After Assessment all the Kind of businesses will be grouped under the respective ‘License Category’. FBO can apply for each license category individually by clicking on the link ‘Click to apply’ link against each License Category (OR) apply for a single highest license evaluated as per the eligibility criteria of all the business by clicking on link above CANCEL button. Once clicked on “Click to Apply” FBO would be redirected to a page where a Declaration/Undertaking is to be accepted . License Application will be submitted successfully, Receipt will be generated take Print out for future refferance, and online application will be forwarded to the respective Designated Officer. How to Track Application Status of Fssai License ? Finally " Fssai Application Status" will be displayed. How to Fssai license renewal online ?